In this IBM® Redguide™ document, we highlight the key requirements for a smarter data center network and show how the data center fabric, a new switching architecture, provides the required performance, scalability, and management. 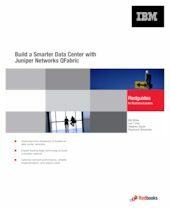 We explore Juniper Networks’ QFabric, a revolutionary DCN fabric product, and describe how its characteristics and key network innovations provide real business value in rapid service deployment, cost-efficient service delivery, energy efficiency, and business resiliency and security. We examine Juniper's QFabric design, product software, hardware, and deployment, and illustrate how QFabric can drastically improve your DCN while reducing your business costs. We describe three common QFabric network use cases that highlight fundamental changes in DCN architecture. Use cases are based on our project experiences, specifically optimized application delivery control, secure isolation provisioning of a multi-tenant environment, and support of business continuity. IBM understands that the first step in transforming network infrastructure is developing an enterprise network architecture that considers business and IT environments, security and privacy policies, service priorities, and growth plans. This guide describes how to migrate to a smarter data center using QFabric and also considers organizational aspects of migration. Over decades, IBM has built deep technical expertise and understanding of the evolving demands of network, server, storage, and desktop virtualization. IBM has extensive design and integration experience in complex DCN infrastructures and cloud computing environments. And IBM has a global pool of skilled networking professionals with in-depth IT and networking infrastructure knowledge and world class project management skills. IBM and Juniper Networks’ strong partnership offers leading edge network products and technologies that will help you create and implement this unrivalled DCN design using the information covered in this paper.